Each circle will meet four times between February and May 2019 via WebEx. Circles will be limited to 6 participants, plus a staff facilitator. Each participant must identify a goal that he or she wants to pursue in order to be included in the group. 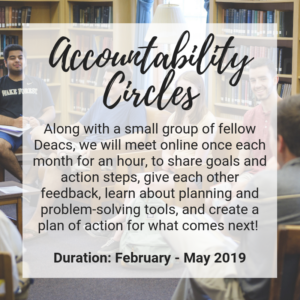 Each participant will be responsible for his or her own progress towards achieving his or her goal; the circle is there for accountability, feedback, and encouragement. REGISTER HERE BY JANUARY 28, 2019!